Spanish Ladies, with a new performance-ready sheet for you & your student guitarist. Take a look at the new music and you will see at once that it will be easy to read & sing the lyrics (& play the chords!) in a recital! This is a swashbuckling song of old England, a sea chantey. 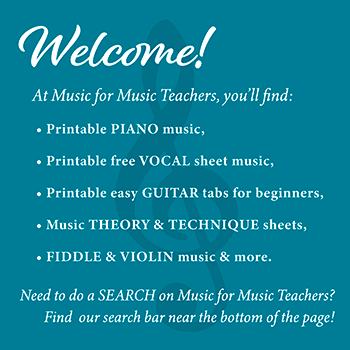 Your students are sure to enjoy this free sheet music for voice, piano, and guitar! This is VERY FUN to play and sing... you might be surprised to know that even little boys will belt this out! Though the parts look as if they are for two men, I actually arranged this duet for a sister and brother. She is capable of singing quite low, so I set the melody as for a tenor (admittedly, rather a high tenor). Her brother's voice is changing - that is, he is in the middle of puberty! - so I didn't want to send his voice too low. If the parts seem either too high or too low for your singers to execute well, have them learn it anyway, and transpose it. Now for the BEAUTIFUL piano arrangement! While the piano part is probably too challenging for younger students, with an accompaniment similar to Johnny Has Gone for a Soldier, it is enjoyable to play, with a bit of delicacy called for at the beginning, giving way to big chords that you can push on if you want! Though I first heard this old sea shanty sung by the captain in "Jaws" (only a tiny part, and sung rather badly), I later came across it in Cecil Sharp's "One Hundred English Folksongs", a treasure trove of old folk songs. My piano arrangement is quite different from his, which has giant chords in the right hand and lots of octaves in the left. A word about pronunciation: after careful listening to several video versions of Spanish Ladies, I decided that "From Ushant to Scilly" should be pronounced "from OOO-shunt to SEE-lee". I hope I'm right; I like the way it sounds and it's fun to sing. Update: In "Poldark" Season 2, there's an episode where smugglers are stopping off in Scilly, and they pronounce it just as I thought: SEE-lee. And here are the guitar tabs for this great song, in the key of Am. The key of Am is the easiest for guitar players, though it is a bit high for some singers. Or too low! So make this a capo song (I like it about fret 5) and both you and your student will have a fun song to practice the capo with. For younger students who want the fun of playing this song on the piano in a simple version (and even playing a duet version) check out the Middle C arrangements... one is in Cm, and one is in Dm. Ae Fond Kiss - not strictly a folk melody, but it is old - and very lovely! Grenadier and the Lady - Number One with me! So beautiful, somewhat sad. Lots of opportunities for expressive singing. Johnny Has Gone for a Soldier - Lovely. Important for breath control and learning to mold a phrase. Lavender's Blue, a pretty song that is VERY simple to sing! Perfect for young girls. Loch Lomond, the most famous song of all from Scotland. Still beautiful. Molly Bawn - So sad, but so IRRESISTIBLE. Lovely and evocative, and requiring good air support, it is educational as well as being satisfying to the musical soul. Muss i denn or Abschied (Wooden Heart) - from Germany by way of Elvis, an adorable folk tune! Parting Glass - There are many versions of this GREAT Irish melody. Download mine free, then check out others! Shenandoah - So pretty, and genuinely American. Long phrases, good breath control practice. Spanish Ladies - a minor key sea chanty that swings energetically along - boys like singing it too! The Spanish Lady - Upbeat and energetic, this song is fun to perform with a group. Star of the County Down - LOTS of fun to sing and play! An excellent ensemble piece. Waltzing Matilda - an unusually pretty melody from Australia; you know this one! Very popular with kids. The Water is Wide - a very pretty song about disappointed love. You might have sung this one in high school! White, Orange and Green - though not widely known, this charming melody about fighting for the right to carry the flag of Ireland has stirring lyrics and soaring phrases. A favorite of my vocal & guitar students. Good for you! Yes, I know just what you mean. Every new endeavor requires a little bit of chutzpah -- not to say just brazening it out a bit, because you just can't be an expert at anything until you've done it for a while. We teachers have to learn how to teach... and you have to start somewhere. I just wanted to tell you that I have found your website EXTREMELY helpful! I have a young group of children that I have started a youth choir with and I was searching for music ideas and I came across your website. THANK YOU SO MUCH! !